So first off, thank you all so very much for the nice feedback yesterday! Four different comments from MsLaraYves, Ambyr, and Loki Trickster really made my day, and also helped me come to a decision on which direction to take the Bimbo High writing! In today's cap I plan on introducing a "narrator" who will describe events at and tell stories about Bimbo High in first person, and most of the caps will come from this person's point of view. That doesn't mean I won't use other styles like exclusively dialogue or an omnipotent 3rd person narrator telling the story, but I think (as did others) that this is a fun style to do and it focuses the plot a bit because it can all be traced back to what the narrator sees/hears/experiences. 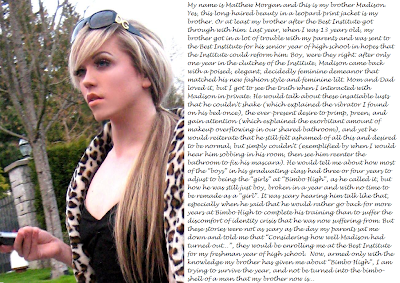 So without further ado, here is a cap as told by the narrator, Matthew Morgan!